Merchant and communal worker of Gibraltar; born in 1812; died at Gibraltar Oct. 14, 1894. He was one of the wealthiest and most respected merchants of the Gibraltar Jewish community, and for thirty years held the position of president of the Hebrew community. He rendered many communal services; reorganized the Hebrew Poor Fund when it was in a very precarious state; and as one of the trustees of the Jewish estates in Gibraltar acquired, by his efforts, valuable possessions for the benefit of the poor among his coreligionists. Bergel was one of the first members of the Board of Sanitary Commission, a member of the Exchange Committee, and took an active part in the management of the Relief Fund at the time of the cholera epidemic in 1865. 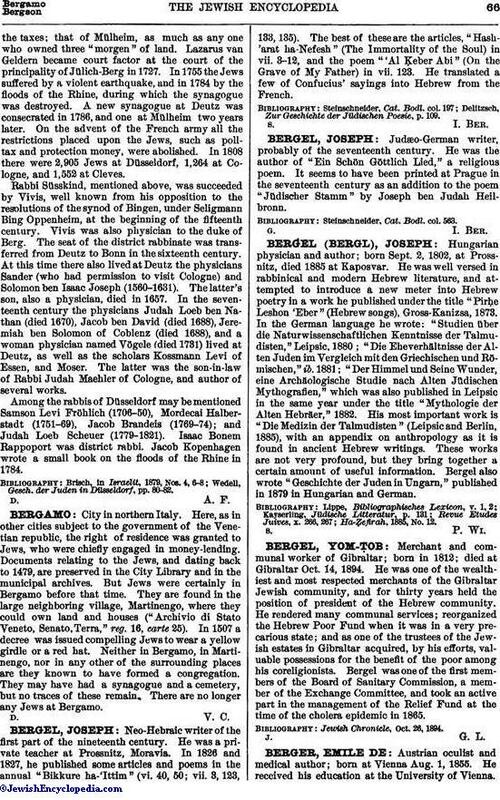 Jewish Chronicle, Oct. 26, 1894.